GUEST WRITER: One of the many hats that Dan Richardson wears is VP of Suksdorfia Chapter of the Washington Native Plant Society. I serve as the newsletter editor for our local chapter and Dan recently submitted this lovely article for a recent edition. I was thrilled when he agreed to let me post it here. Lots of good information including 3 simple ways for gardeners and homeowners to do. He also included a list of resources. Enjoy! Last year, in late summer, a monarch stopped by. A monarch butterfly landed at my suburban east-end Columbia Gorge home and zeroed in on the single milkweed growing there. The butterfly danced amid the pink flower clusters for some long minutes seeming to drink deep, flitting, landing, drinking, then vanishing, on its long, long inter-generational journey. The lovely monarchs need the humble milkweed, a native perennial with tall stems and clusters of lovely, complex little flowers. Mine is growing out of a seed that parachuted in on its long silky seed hairs. The plant’s numerous stems now sprout from under a fence, in gravelly, unwatered soil – a survivor who thrives in its near-desert habitat. I was fortunate to glimpse the butterfly and its plant in action. We don’t see that many around here. Probably because there aren’t that many native plants in my neighborhood, amid the roses and Scotch pines and square lawns of Kentucky bluegrass. Native plants, of course, are well-adapted to this place, as to all places. They generally use less water than our much-coddled garden plants (my milkweed asks for nothing and receives only what falls from the sky), and need less care. 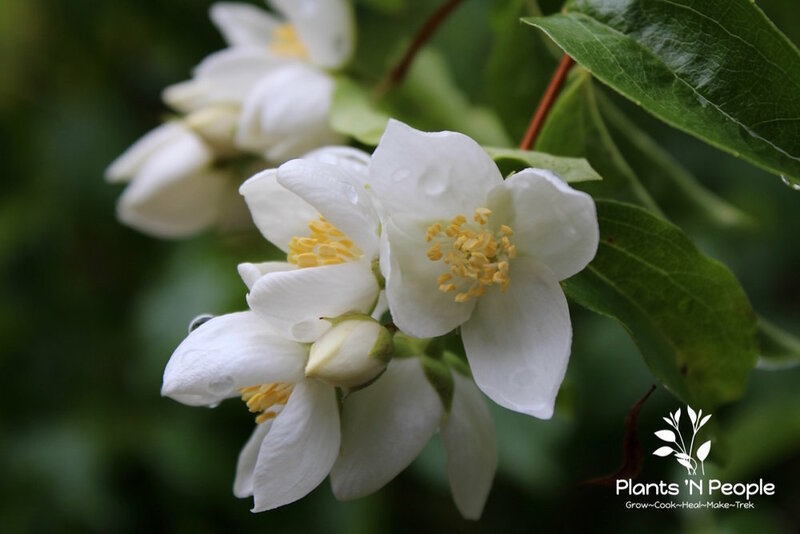 Many are beautiful shrubs: Have you seen a mock-orange in its full bloom? Mock-orange (Phiadelphus lewisii) Large, woody spreading shrub that grows in moist woods, conifer forests, canyons throughout western North America. Named after Meriwether Lewis. Besides a project (your project, right? ), incorporating native plants into our landscapes and wild edges is an awareness, an appreciation for the interacting gears of our ecosystem. At bottom, at the base of every food-web and the foundation of natural wealth, it’s all about the plants. We can, if nothing else, include Nootka rose, Oregon sunshine, native red columbine among our roses and mums. Pollinators may visit exotic garden plants, may even use some, but their best nutrition, sometimes their only nutrition, comes from the plants they’ve known for many hundreds of generations, the natives. ONE: Plant clusters, bunches, areas of a native plant, rather than a single specimen. This might be easier said than done, at first. I confess that I’ve not quite gotten there myself. I think there’s room for a second golden currant in the back corner of my property; and definitely space for a few more snowberries behind the compost pile. TWO: Plant a diversity of species – shrubs, forbs, grasses – for habitat structure and, critically, for three seasons of blooming. Pollinators need things to visit in the spring, the summer and the fall. Early-season bloomers (willows, Oregon grape) are especially important. And while native plants are best for native pollinators, a yard with an abundance of diverse plants is a thing of beauty and support for them. Many herbs and vegetables provide useful diversity for beneficial insects, from the mints and lavenders to oregano, rosemary, Russian sage and cosmos. 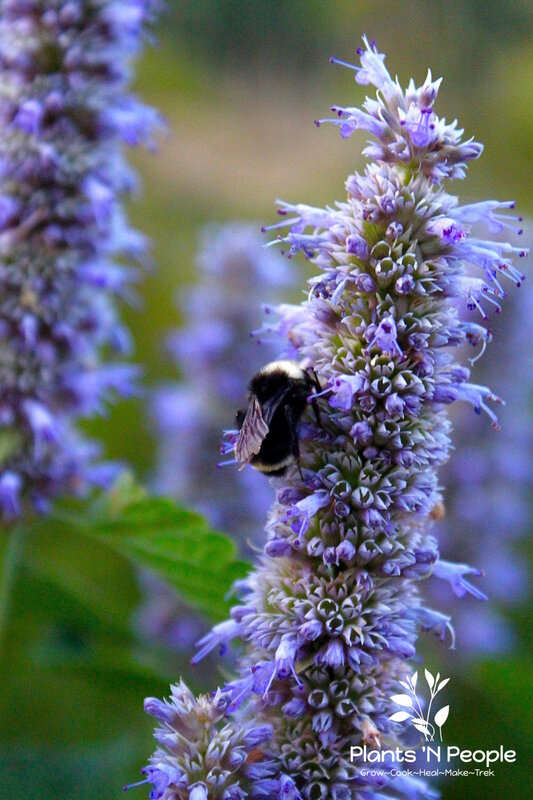 Anise Hyssop (Agastache foeniculum) A lovely herb in the garden helps sustain pollinators. THREE: Ease off the pesticides. 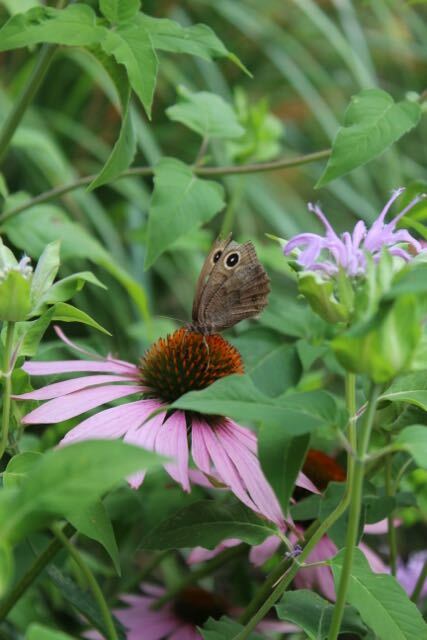 Native plants generally don’t need us to protect them from the various arthropods that feed, breed and live on them. And really, aren’t poisons the antithesis to the gardener’s art? If you must spray something, minimize your use, read the label carefully (and follow it), and apply the chemicals at dusk, when pollinators are likely to be sleeping, and not feeding on the stuff. Washington State University publishes the online booklet “Landscaping with Native Plants in the Inland Northwest,” which focuses on east-side communities and plants. That can be found online HERE. The Xerces Society, which conducts primary research and acts in coordination with the National Resources and Conservation Service and other agencies, publishes books and papers: check out www.xerces.org. Russell Link’s book Landscaping for Wildlife is a classic for anyone in the Northwest interested in such things – and its layout and design illustrations make it a pleasure to leaf through for ideas. You can find it HERE. I find this online yard-design page interactive and fun – highly recommended: Washington Department of Fish and Wildlife’s site Landscape Design for Wildlife (a distillation of Link’s work: http://dfw.wa.gov/living/landscaping/index.html). For straight-up inspiration, and help sourcing locally adapted native plants, my go-to source is Humble Roots Nursery in Mosier (http://www.humblerootsnursery.com/). Their site has a gorgeous gallery of native shrubs, forbs, grasses and trees. Go there and be inspired! A narrow-leaf milkweed, Asclepias fascicularis, to be precise. But can we stop calling them milkweeds? They are native plants, blossoming in the central and eastern Columbia Gorge in their native habitat. They are weedy looking, sure, but they are harmless and non-invasive. Given their critical role for butterflies, particularly monarchs, can we call them monarch plants instead? The Monarch Joint Venture website is a one-stop site for those wanting to read more about the monarch’s biology, its incredible journey, and some efforts at conservation. On the West Coast, probably the Xerces Society is the most active conservation group in support of monarchs -- http://www.xerces.org/monarchs/ -- and other invertebrates. To dig into the literature critically, one could start with http://horticulture.oregonstate.edu/content/pollinators-urban-and-suburban-gardens and follow the literature highlighted there, and also take up one of the most current, standard texts from the Xerces Society: Attracting Native Pollinators. A copy is available at most libraries. If you click on one link in these footnotes, make it this one. A couple of books make the thoughtful case for yard-by-yard habitat efforts, including Bringing Nature Home by Douglas Tallamy. Some would correct me here and say it’s all about the soil. They are right to do so. But soil’s vital ecosystem services (carbon storage, etc.) are intimately intertwined with plants and their co-dependent life forms. Yes, plants need mycorrhizae and other soil-borne organisms; but those lifeforms needs plants and their carbon-capturing, sugar-producing link to the sun. It’s a case of and, not either-or. I say pollinator gardening and mention pollinators as vitally important. Pollinators are not the only things interacting with plants, of course; but to take a sub-set like butterflies or wild bees, that’s a useful focal taxa in helping us dig into the details of native plants and interactions on the human landscape. Pollinators need the same thing as other wildlife. And if we are to have more than omnivores and generalist species – the deer that eat your lilies, the raccoons that raid your dog food, the ear-wigs that hide in your roses unless you douse them with poisons that kill all many of beneficial insects – we need native plants. Such as Planting in a Post-Wild Word by Thomas Rainer and Claudia West. See www.timberpress.com.